Cold Steel Thai Machete(97THAMS) Machetes for every day use. Cold Stell machetes - high carbon steel survival machetes. Taking inspiration from Thai swords in his personal collection and from his extensive training in the Thai Martial Arts, Lynn Thompson began exploring his own interpretation of a Thai sword in our Machete format. Lynn has been an active practitioner of Thai Martial Arts since the early 1980s. Studying Thai Boxing with Bill Berg and the late Ernie Franco before exploring Muay Thai and Krabi Krabong in greater depth with his current training partner and instructor of over 13 years, Ron Balicki. 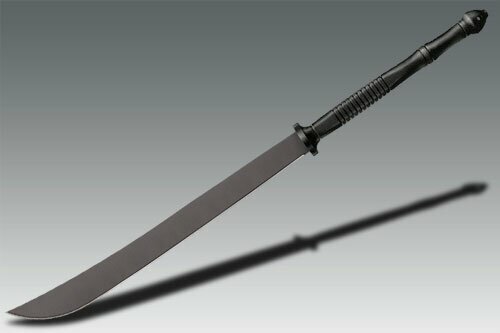 The Thai Machete represents the culmination of over 4 years of development and refinement. Like the Thai swords that inspired it, our Machete is beautifully balanced, with a keen cutting edge and sharp tip. Though most commonly seen used in pairs when practicing traditional Thai fighting arts, these long curved blades are amazingly versatile. Light enough to swing one handed, but with a long enough handle to employ a two handed grip for extra leverage and cutting power. The Thai Machetes wide blade and curved cutting edge make it an excellent bush cutter. Slicing grass, vines and light foliage with ease. Its fully sharpened blade is made from the same tough 1055 Carbon Steel as the other classic blades in our incredibly popular Machete line up. Its tough, traditional looking polypropylene handle has a flattened oval grip that won’t twist or turn in your hand, while its steel reinforced guard offers surprisingly good hand protection. Comes with nylon sheath.